The Cote d’Azur Card is a flexible and useful tourist pass. It is most useful to travelers spending at least 3 days on the French Riviera. Valid for 3 days within the 6-day period, the card allows you to see and experience many interesting attractions and activities. That way, you can combine sightseeing and other activities how it is convenient for you. 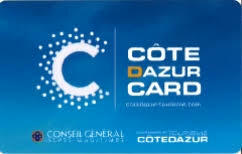 For example, you are free to use the Cote d’Azur Card one day, and pause the next before putting it to use again. The tourist pass encompasses nearly 200 attractions and activities in around 60 towns and villages along the French Riviera. For the price of the pass, you gain free access to many points of interest and benefit of included activities. The pass includes free visits to museums, wine tastings, biking & hiking activities in the nature, extreme sports, boating & canoeing, and much more. Some participating monuments are: Notre Dame-des-Fontaines Chapel (La Brigue), Medieval Fortress (Villeneuve-Loubet), Nice Observatory, Oceanographic Museum (Monaco), Villa Kerylos (Beaulieu-sur-Mer) and Grimaldi Castle and Museum (Cagnes-sur-Mer). Some participating excursions: Nice Open-Top Bus Tour, Undersea Vision (Agay), Ile Ste-Marguerite Boat (Cannes), Little Trains (Antibes, Cannes and Grasse), Guided Cruise (Nice) and Nordic Walking Hike in the Esterel. Cycling and mountain biking activities: Mountain Bike Day at Auron, Day of Mountain Biking at Caille, Electrically Assisted Mountain Biking at Roubion and Electric Mountain Bikes at Saint-Cassien Lake. Some included vineyards and wine-tasting activities: Le Clos de Roses (Frejus), Domaine de la Royrie (Grasse), In the Land of the Lemon (Menton) and Vins de Bellet Wine Tasting (Nice). Certain participating sea and beaches activities: Sub-Aqua Trail (Frejus), Sea Kayak (Menton), Cruise with Commentary (Villefranche), Beach Day in St-Laurent-du-Var and Kayak Excursion (or stand-up paddle board) in St-Jean-cap-Ferrat.